Fears that Egypt’s revolution could be hijacked by increasingly vociferous political Islamists are threatening to cause an exodus of the country’s minority Coptic population. Since the toppling of Hosni Mubarak in February, large numbers of Egyptian Christians have been making plans to leave the country if political organisations like the Muslim Brotherhood manage to take control in elections scheduled for later this year. Lawyers who specialise in working with Coptic Egyptians – who account for around 10 per cent of the country’s 80 million citizens – say that in the past few weeks they have received hundreds of calls from Copts wanting to leave Egypt because of the political uncertainty. Naguib Gabriel, a prominent Coptic lawyer and head of the Egyptian Federation of Human Rights, said his office had been receiving at least 70 calls per week from people wanting to know how they can emigrate. He said: “Every day people come to me and ask how they can get to the American or Canadian embassies. They are insisting on leaving Egypt because the risks of staying here are too great. Though much of the focus on Egypt’s uprising has remained upbeat – especially in comparison to the bloody quagmire developing in neighbouring Libya – the period since Mubarak’s ouster has been marred by vicious bouts of sectarian strife. At least 15 people, Christians and Muslims, were killed last month in a chain of violence which erupted because of a relationship between a Coptic man and Muslim woman in a village south of Cairo. This led to a hundreds of Christians joining a prolonged demonstration outside Cairo’s state TV building in a bid to secure better protection for the Copts from Egypt’s ruling military council. In recent days there have also been clashes involving Egypt’s Salafi movement, a fundamentalist Islamic sect which is considered even more conservative than the Muslim Brotherhood. 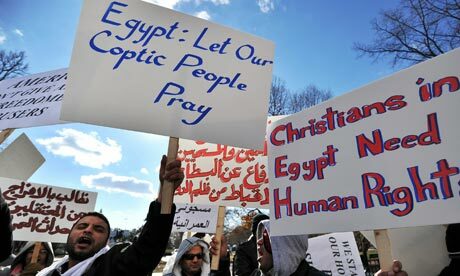 According to reports in the Daily News Egypt, a Coptic service centre in Cairo was closed down this week after being picketed by Salafis, while in the Fayoum province south of the capital fights broke out after the sect tried to force the closure of a shop selling alcohol. It all seems a far cry from the days when demonstrators in Tahrir Square were declaring: “Muslims and Christians are on one hand”. “The issues now are worse now than in the past,” said Mr Gabriel. “In the past there were problems, but there were long periods between them. Mamdouh Nakhla, a Coptic lawyer, said his office was speaking to around 150 people per month who were making plans to leave Egypt because of the political situation. Some were Muslims, he said, but most were Copts who were worried about the prospects of a Brotherhood-dominated government. According to both Mr Nakhla and Mr Gabriel, most of the people planning to emigrate want to go to Canada, where there is a large Coptic population of around 50,000. The Canadian embassy in Cairo said it could not reveal how many Egyptians had applied for visas there since the uprising began. But Sam Fanous, who runs a company helping Egyptians emigrate and settle in Canada, said that over the past month his office had been “bombarded” with requests from Copts who wanted help in leaving the country. Mr Fanous said most of the people coming to him were well-off professionals. But he also said there was a difference in attitude between older Copts he had spoken to and the younger generations. Nada Rafik, a 21-year-old Copt from Cairo, said that since the revolution her mother had been making plans to move the family to Canada. She said: “My mother has been trying to get a Canadian passport for the past year, but since the revolution she’s been saying ‘let’s try and get this done quickly’. Ms Rafik, a financial analyst, said that she would also consider leaving, but only if the situation got much worse. Parliamentary and presidential elections are expected later this year after a recent referendum rubber-stamped constitutional changes which the government had argued were necessary for a fair ballot. Critics have said that holding the polls this year will benefit only the Muslim Brotherhood and formerly-ruling National Democratic Party, as they are the only organisations currently strong enough to fight an election. But the Muslim Brotherhood has swatted away concerns it will secure too much power, saying it will not contest more than 30 per cent of parliamentary seats and will field no presidential candidate.